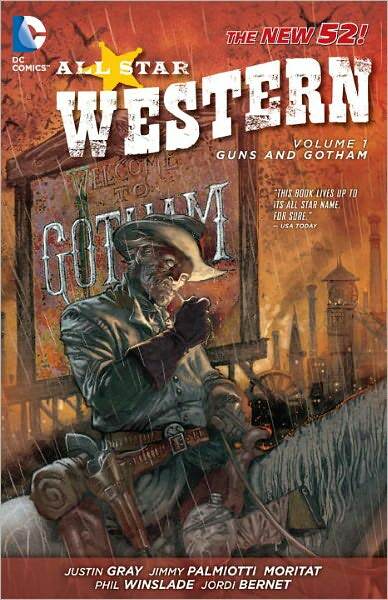 Justin Gray and Jimmy Palmiotti have struck gold in the All-Star Western comic in DC’s New 52. When I first heard the idea – Jonah Hex in Gotham City, I didn’t think it would fly. I didn’t see how Hex’s point of view would fit in the metro area. Gray and Palmiotti neatly side-stepped that issue and found a whole new layer of incredible narrative through the first-person point of view of Amadeus Arkham, whose descendants have definite ties to today’s Gotham City. Amadeus as narrator for the stories is just genius. That device allows the reader to get a closer view of Jonah Hex than ever before, while at the same time letting us in on more of Gotham’s increasingly sordid history. One of the more fascinating aspects of the series is the way the ancestors of Batman’s villains (as well as Batman’s own ancestors) show up in the pages of this graphic novel. A Cobblepot (Penguin) is mayor, there is mention of the Crime Bible, and the gothic architecture – though not as dark as in the Batman book – is present on every page. I love the fact that the mismatched duo of Hex and Amadeus work so well together. Somehow, despite the fact that the two men are oil and water, the authors manage to make the partnership (can’t call it a friendship at this point because Amadeus annoys Hex to no end, and Amadeus isn’t all that enamored of Hex’s ways either) work so well. Amadeus’s asides on Hex’s character and nature are, of course, spot on, and his field of psychology makes him a fantastic lens through which to study the ex-Confederate bounty hunter. There are two main stories contained within this first volume, though the narrative runs loosely enough that all the tales work together enough to be a continuing tale that never breaks. The first story centers on the pursuit of a serial killer that becomes known as the Gotham Butcher, and the second has to do with missing children that ends up taking a page from present-day headlines as well as the Industrial Revolution’s child labor laws in England. Gray and Palmiotti are great with their history, too, and so subtle that you have to actually know events and time lines to understand how deftly they’ve woven that into the action-packed tapestry. I’d never heard of the artist before, but the job Moritat did on the cover and on the story pages is fabulous. He worked in a lot of art on every page. Characters come to life there, but also the twisted, cloistered hulks of Gotham’s late 19th century landscape. The scenes in the sewers feel particularly claustrophobic. Although the first issue doesn’t have a backup feature, the other five issues do. Gray and Palmiotti chose an old Western hero named El Diablo for their first backup, and they provide a twist on the character that I don’t remember being there. 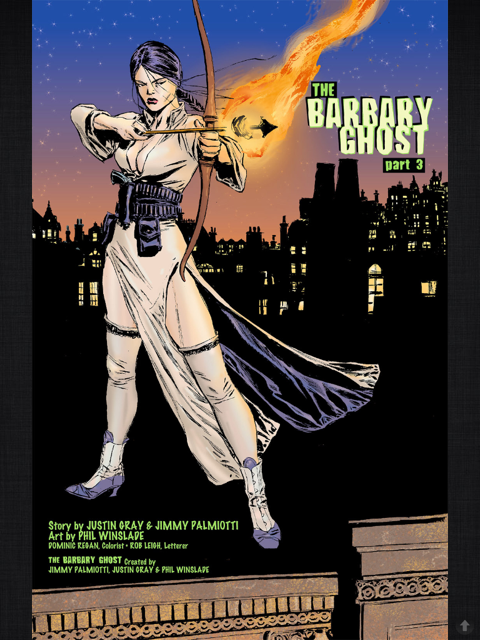 The second backup is a three-parter about a woman character known as the Barbary Ghost, obviously a play on the Barbary Coast. The backup was a little lean on character interest after being drawn so tightly into the Hex and Amadeus storyline, but I enjoyed the artwork by Phil Winslade (also new to me) immensely. The first volume leaves a thread hanging, an escaped mastermind that Hex rides off to New Orleans after, so I’m sure the next volume of All-Star Western will be a ripsnorter as well. If you haven’t tried this new series, you should. You’re missing out on something special. Moritat was my favorite part of this series, I know him from Elephantmen (He did a sketch of an Elephantmen character that hangs in my comics room). I was surprised he was doing a Western series when I had only seen scifi from him but his Early Gotham looked wonderful. Agreed. It was the atmosphere on the pages that really sold me. I’ll have to check out his other stuff. This entry was posted on July 8, 2013 at 5:55 am and filed under Adventure,comics,Crime,DC Comics,Graphic Novel,series fiction,Superhero,Western,Young Adult. You can follow any responses to this entry through the RSS feed. You can leave a response, or trackback from your own site.